This webinar will explore how telepsychiatry can play a critical role in addressing the shortage of psychiatrists available to provide treatment for patients with opioid use disorders. 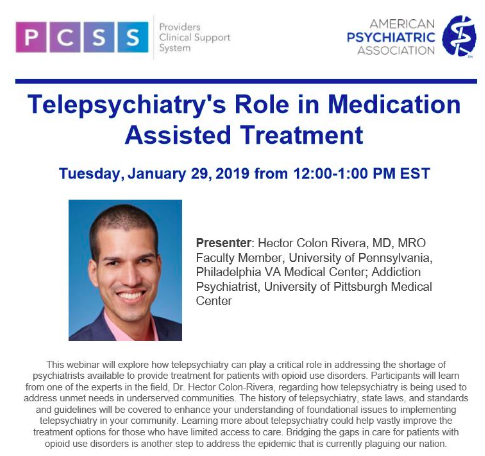 Participants will learn from one of the experts in the field, Dr. Hector Colon-Rivera, regarding how telepsychiatry is being used to address unmet needs in underserved communities. The history of telepsychiatry, state laws, and standards and guidelines will be covered to enhance your understanding of foundational issues to implementing telepsychiatry in your community. Learning more about telepsychiatry could help vastly improve the treatment options for those who have limited access to care. Bridging the gaps in care for patients with opioid use disorders is another step to address the epidemic that is currently plaguing our nation. If you plan on viewing this webinar with a group, please be sure to register each attendee individually. Thank you.